Mary Mary’s Erica Campbell goes solo and strikes gold. Known as one-half of the platinum-selling sister sensation Mary Mary, Erica Campbell is setting out solo. And she’s doing it big. Her chart-topping LP, Help (My Block/ eOne), has already amassed a No. 6 spot on Billboard’s Top 200, a Grammy nod for the lead single, “A Little More Jesus,” and a quickly rising Top 10 radio hit with the title track, featuring Lecrae. Giving CCM an exclusive chat, Campbell talks going solo, her sister Tina and being a reality TV star. CCM: After having recorded so many records and having been recognized for so long as part of Mary Mary, what prompted a solo record? 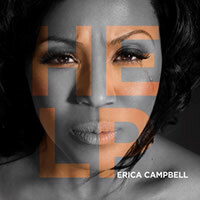 ERICA CAMPBELL: Initially, the solo record was just a change of pace so Tina could take the much-needed break she asked for and I could continue to sing. When I was a little girl I sang solos in church. As a teenager in the choir I was the lead soloist. Mary Mary just happened, and I have been extremely grateful for it; but I had forgotten these dreams I had as a child of just me singing to people. Maybe God allowed this just to let me know He didn’t forget my dream! I’m so grateful. CCM: What freedoms did you experience recording solo? In what ways did you miss Tina? ERICA: Because it’s just me, Help stretched me vocally. I wanted to record more collaborations; but Warryn [Campbell], my husband and producer, said, “You have been collaborating for years. Just let the people hear your heart and voice.” So I had to gain more confidence to do this alone. I asked Tina to come and help me write “A Little More Jesus,” which got a Grammy nomination this year! Even though we do a lot less together, she is still my sister and BFF. We talk every day about what’s happening and how we are growing as women. CCM: How is Help reminiscent of or different from Mary Mary’s discography? ERICA: The only connection between my solo music and Mary Mary is my voice. The style is more diverse. I love so many different styles, which I think helps reach different people with the message that God is everything we need and more. Some songs are a little rock-and-roll. Some are a little folk. ERICA: I had a rough year last year. I knew I wasn’t totally equipped to handle it by the way I was responding to the drama. I needed a little more Jesus or I wasn’t going to make it through! Anytime a problem arises, we should turn to Jesus. We try and fix things our own way first. That’ll get you in trouble every time. CCM: Let’s talk about Mary Mary, the reality TV stars. Any adverse effects of being so exposed with your family’s WE TV series? ERICA: Oh, the show! [Laughs] I believe the show has been successful because of our honesty. It’s been a rough year, especially for Tina. I applaud her for being brave enough to try and live out forgiveness in front of the world. My family doesn’t claim perfection, but we definitely claim that God is the source for everything.